The MCP9600 is a fully integrated thermocouple Electromotive Force (EMF) to degree Celsius converter with integrated cold-junction compensation. The MCP9600 supports eight thermocouple types (K, J, T, N, S, E, B, and R). It also provides user-programmable registers, adding design flexibility for various temperature sensing applications. The registers allow user-selectable settings, such as low-power modes for battery-powered applications, an adjustable digital filter for fast transient temperatures, and four individually programmable temperature alert outputs, which can be used to detect multiple temperature zones. The MCP9600 Evaluation Board is used to digitize the thermocouple EMF voltage to degree Celsius with +/-1C accuracy. Users can easily evaluate all the device features using a Type K thermocouple. The device also supports Types J, T, N, E, B, S, and R. Each of these types is evaluated by replacing the Type K thermocouple connector with the corresponding connectors (not included). Thermal Management Utility works in conjunction with demo board to provide real-time measurements and configuration of device parameters. 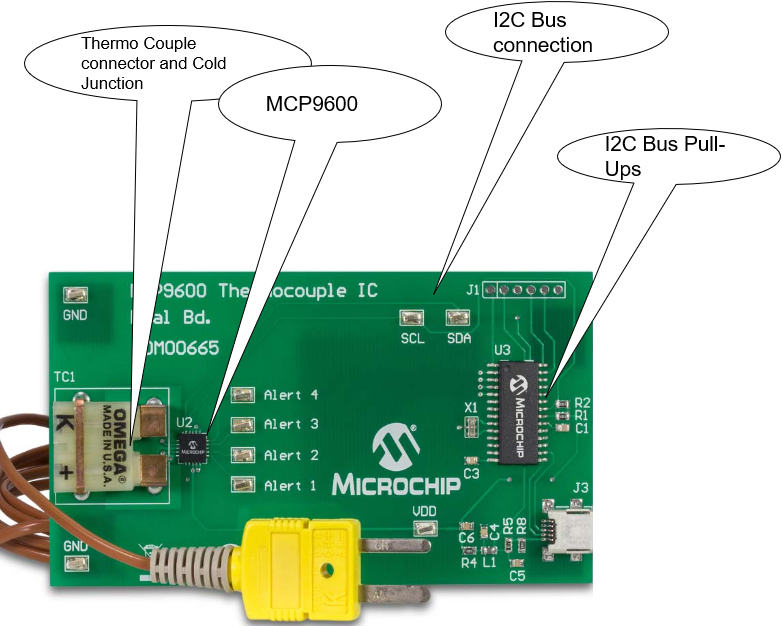 MIKROE #2811 CLICK BOARD and MCC drivers and development environment allows rapid prototyping and evaluation.